The Scribbler sounds like it should be a pretty good movie. The script was penned by the writer of the graphic novel it was based on. It has a solid cast of actors and an interesting premise. But I couldn't help thinking of other movies while I watched. 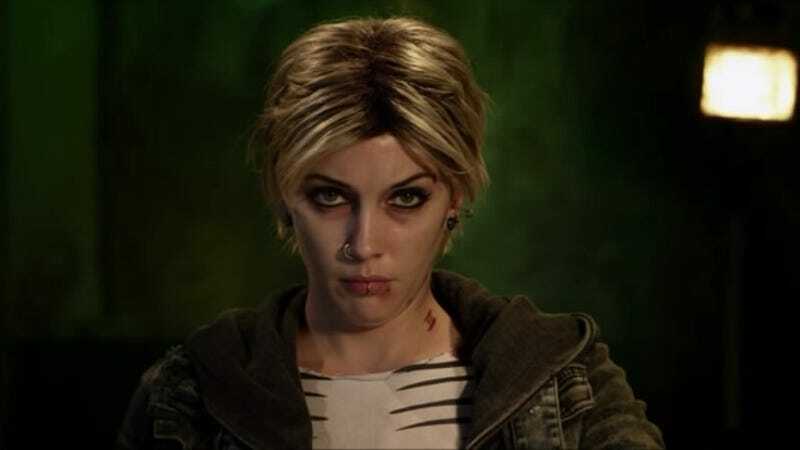 Katie Cassidy plays Suki, a young woman with multiple personalities (including the titular Scribbler). She's living in a halfway house for mental patients while undergoing treatment with a device that is supposed to get rid of the other personalities. Of course things go awry. I only know Katie Cassidy from Harper's Island and as David Cassidy's little girl*. She does a good job playing a much less glamorous character and I didn't even recognize her at first. Her performance is one reason to watch the movie. I was thinking of Identity for much of the movie (there are some obvious parallels). Some of the graphic novel aspects had a Sucker Punch vibe to them (I liked Sucker Punch so that's not meant as an insult) and other parts were very film noir (Eliza Dushku looks like she stepped straight out of a 1940s movie set). Despite spending a lot of time comparing it to other movies while I watched The Scribbler is not a bad movie. I thought I knew where the movie was going but I was surprised by the ending. Some people will hate the ending and some will love it. Given the story and the cast (Katie Cassidy, Garret Dillahunt, Gina Gershon and an unrecognizable Michelle Trachtenberg among others) this may become a bit of a cult classic in time. The Scribbler is currently streaming on Amazon and other sites. *Also this is the second review in a row featuring someone from Arrow.